Does an anti-abortion billboard in SoHo targeting African-Americans veer into racism, or expose a societal issue crying for attention? The three-story billboard purchased by a Texas anti-abortion group has stirred an outcry, all the more because of its loaded presentation. It features an image of a young black girl accompanied by the text: "The most dangerous place for an African American is in the womb." Many New Yorkers were outraged at the sign, calling it racist. "Tear that thing down!" said City Councilman Charles Barron (D-East New York), who plans to write a letter to Life Always about the billboard. "It needs to come down immediately." But in defense, Rev. Derek McCoy, a board member of the group, Life Always, said the goal is to bring attention to abortion rates among African Americans. "We do think we've gone too far, and we do think it's over the edge," he said. "But the city's abortion rates have crossed the mark and are over the top. "We want to raise awareness and create the dialogue … and let women understand that there are alternatives, all throughout the city." According to 2006 statistics from the Centers for Disease Control and Prevention, African Americans account for about 13 percent of the country's population, but for about 35 percent of its abortions. Chris Slattery, president of anti-abortion organization Expectant Mother Care FrontLine Pregnancy Centers, agreed with McCoy. "I think it's spot on the money," he said. "It is absolutely a completely factual truth … for anyone to say this is inflammatory or untrue is nonsense. It's just a plain fact." The billboard also targets Planned Parenthood, which McCoy said uses "direct targeting" by putting clinics in minority neighborhoods. 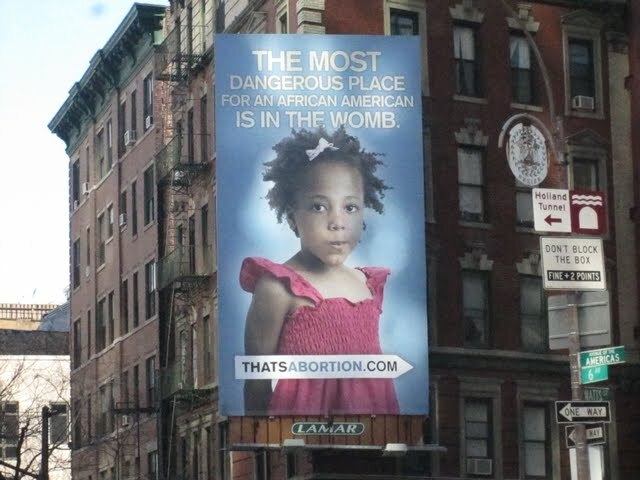 Joan Malin, chief of Planned Parenthood New York City, called the sign a "reprehensible act." "[The billboard is] an offensive and condescending effort to stigmatize and shame African-American women while attempting to discredit the work of Planned Parenthood," she said. Some politicians in the city were just as outraged. City Council Speaker Christine Quinn said the billboard is "nothing but a pathetic attempt to discredit Planned Parenthood." Many New Yorkers felt the same way. "I hate it. I think it's racist," said Scott Ettin, 45, of the Upper West Side. "Any woman who wants to have an abortion should be able to," he said, adding that the billboard is right outside his office window and he wants it taken down. But others, such as Kat, who declined to be further identified, were surprised but ambivalent to the billboard. "Honestly, I don't know quite know what it means," she said. "Somebody is speaking their opinion very loudly, and I think that’s their right, just as I have the right to speak mine." I'm guessing there is a statistic supporting that Black women have more abortions. Even so, the ad is very offensive. Society does not have much empathy for black women; this just adds fuel to that fire. If the goal is to bring awareness to the black community and perhaps educate black women on options, there are much better ways than this. When I read this post of yours I was shocked! Whether or not people think it's racist, it's hugely negative. We should be taking positive approaches instead of trying to shame people!